As the last day of school approaches, what could be a more compelling subject for a book than memories of the school year? 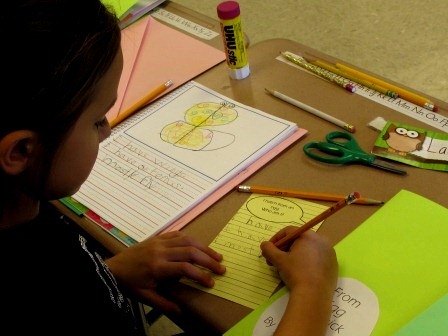 Before I started my time with these first grade students they had worked with their teachers, making lists about activities and events that stood out to them over the school year. 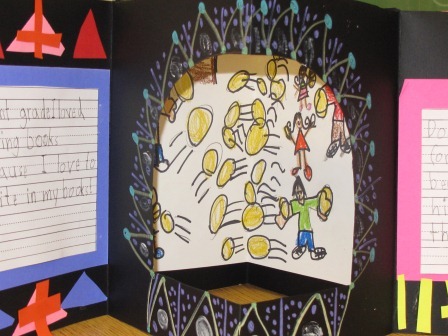 They made drawings and did writing that reflected their favorite memories. 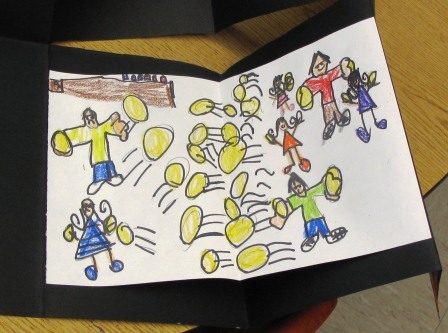 Playing Dodgeball was a big favorite First Grade Memory for these students. I remember liking dodgeball, too. 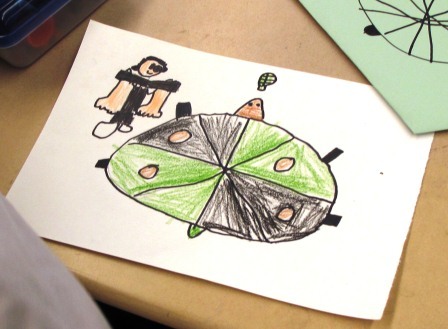 I never get enough of looking at drawings by first graders. 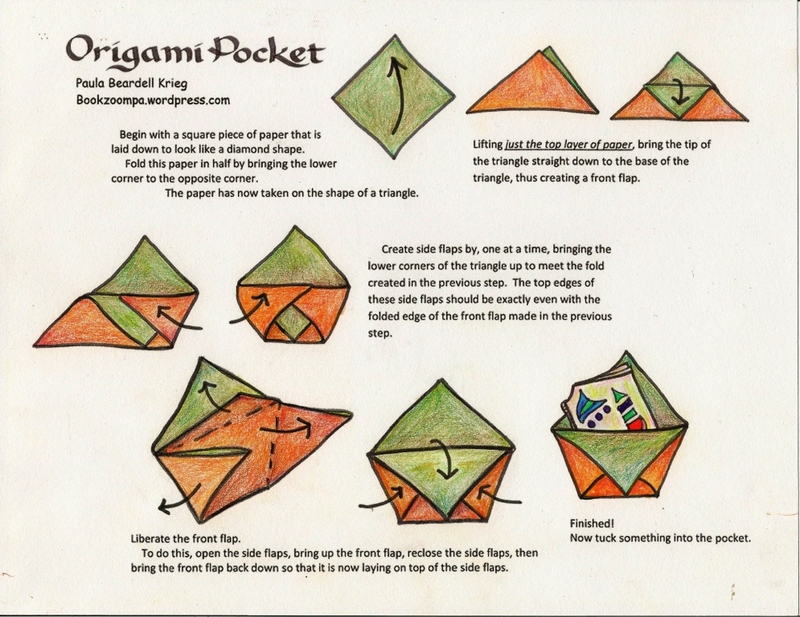 Cutting a window into the Origami Pamphlet makes the drawing the centerpiece of the book. 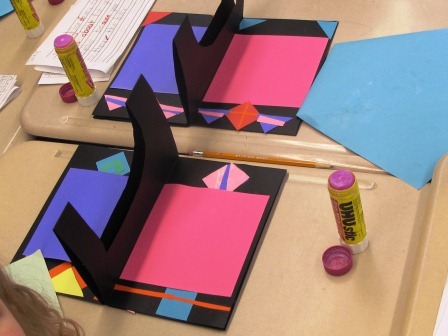 Update -oops, as I was thinking that this design seemed more sophisticated than what the average first grader could do, it occured to me that this is the work of one of the teachers, Mrs. Israel. Each time that I give my lesson on making WOW! designs I am stunned by the inventive variations that the students come up with. It seemed to me that playing dodgeball, having an in-classroom “camping” experience and, having an ice-cream party were among the most celebrated events of the year. 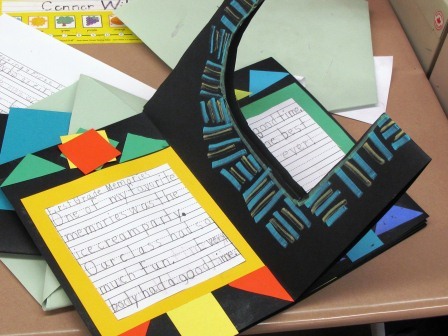 Only one student ranked “bookmaking” as a favorite memory, but I supposed that, while I was there, bookmaking hadn’t actually become a memory just yet. 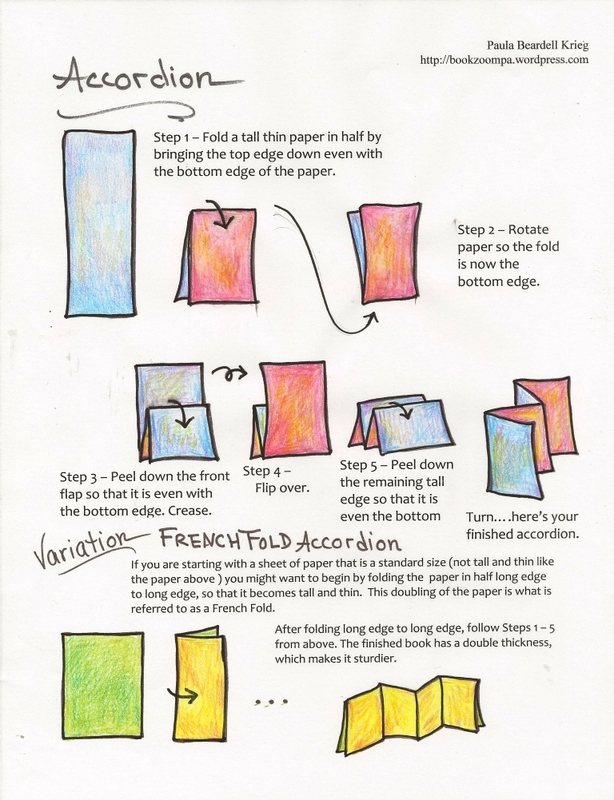 Now here’s one of my favorite drawings…. As usual, but not shown, I asked students to trace their hands on the last page of the book. The traced hand is a great addition to a first grade book because at this time next year each of their little hands will be significantly larger. 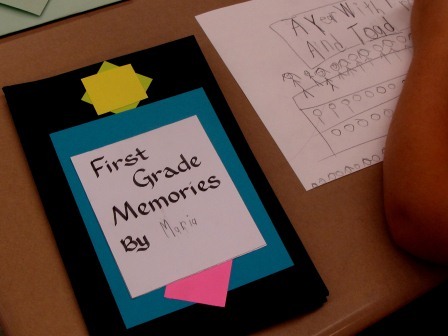 So, if you are a first grade teacher reading this post and thinking about memory books for your students, don’t forget the hands. 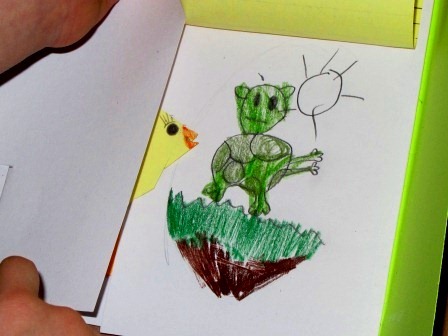 I thought I could seamlessly transfer the elements of the dinosaur project to different colored papers with chicks instead of dinosaurs, but things turned out to be more interesting than I had envisioned. These teachers (a team of four teachers for about 80 students) had put together a full blown science unit of study. 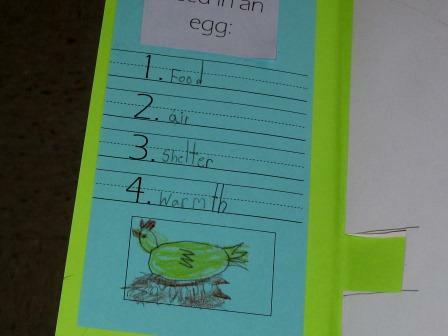 With real eggs incubating in the classroom, the teachers presented a lesson on “what a chick needs in an egg.” We tucked this info on the left flap of the book. … which they then transferred on to the right inner flap of the book. 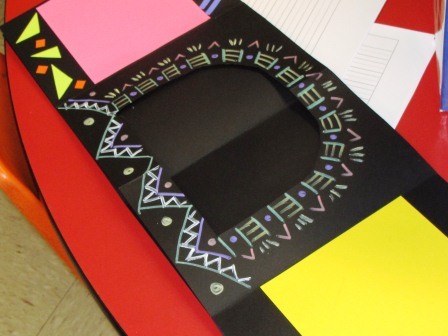 The students glued down just the top edge of the paper, creating a peek-a-boo experience. 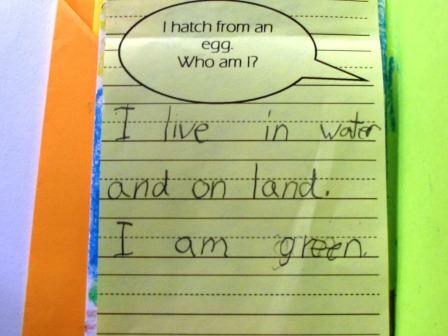 It turns out there are many animals that hatch from eggs. I think I learned at least as much as the students . 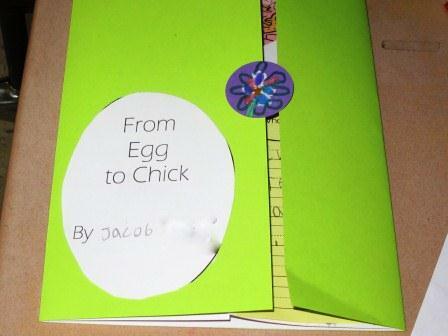 The teachers also talked about the different stages of development of the chick inside of the egg. 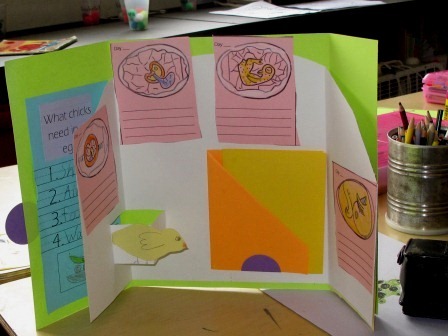 We worked together to create images for four milestones of gestation, which the students colored, cut out, glued on across the inside of the pages, then labeled the images sometime after I took this photo. Here’s what the project looked like the day that I left. 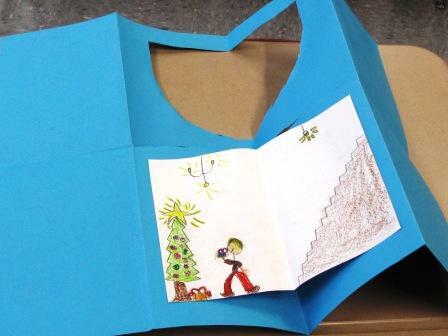 Like the dinosaur project, there is a book tucked into the middle pocket which will contain student writing. 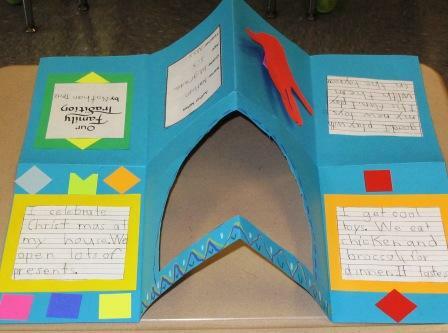 I believe that these first graders will be writing a story featuring a baby chick. 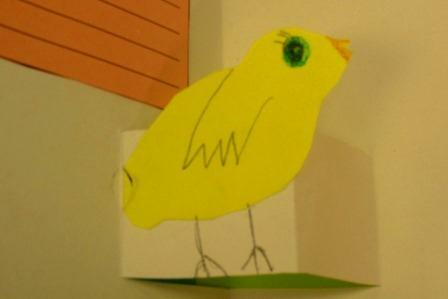 I hope that students will draw in a habitat around the chick. On the back side of these papers is a brief “Author’s Notes” page, along with a tracing of the student’s hand. 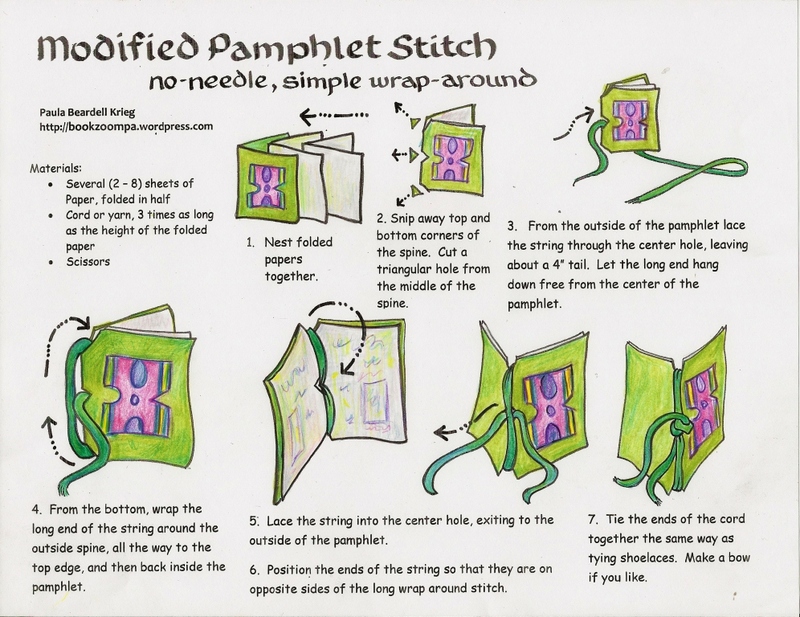 If you are so inclined to do this project, here are the pages that I created that helped us keep moving along. 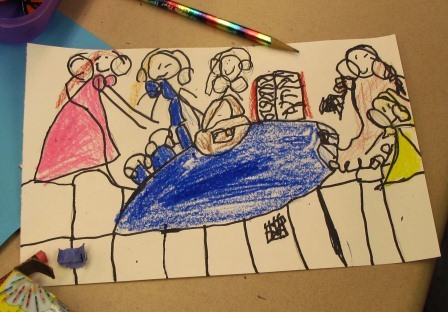 This past week I worked with four classes of enthusastic and creative first graders (about 80 students). 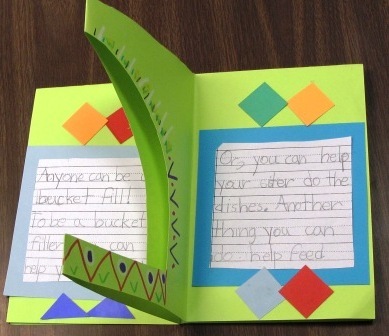 We celebrated their emerging writing skills by making books for their work. 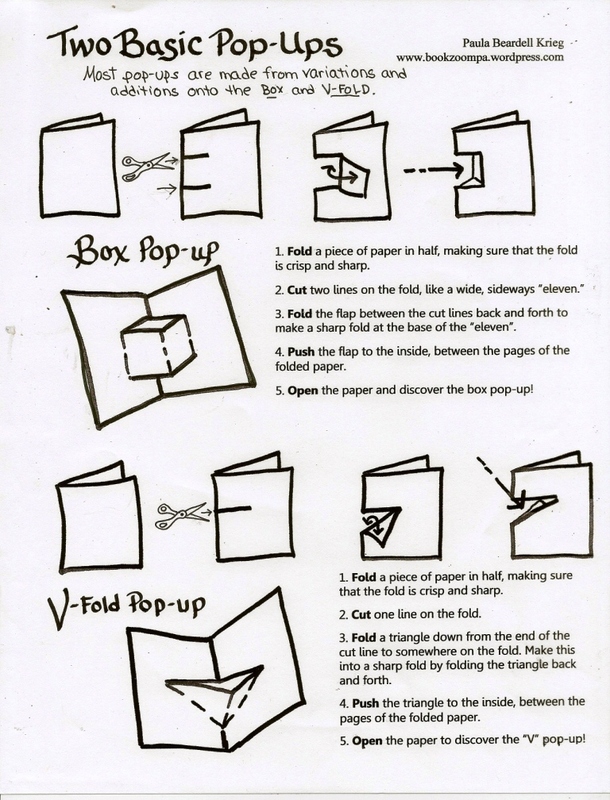 We started with a 23 inch x 17 1/2 inch piece of paper, then folded and cut our way into an origami pamphlet with a window. They liked the window. 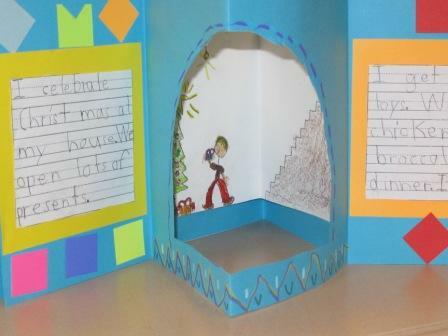 The window starts out looking like a page that has a bite taken out of it: a gentle tug on the side pages opens the window to reveal the “secret room, ” where the book’s illustration resides. 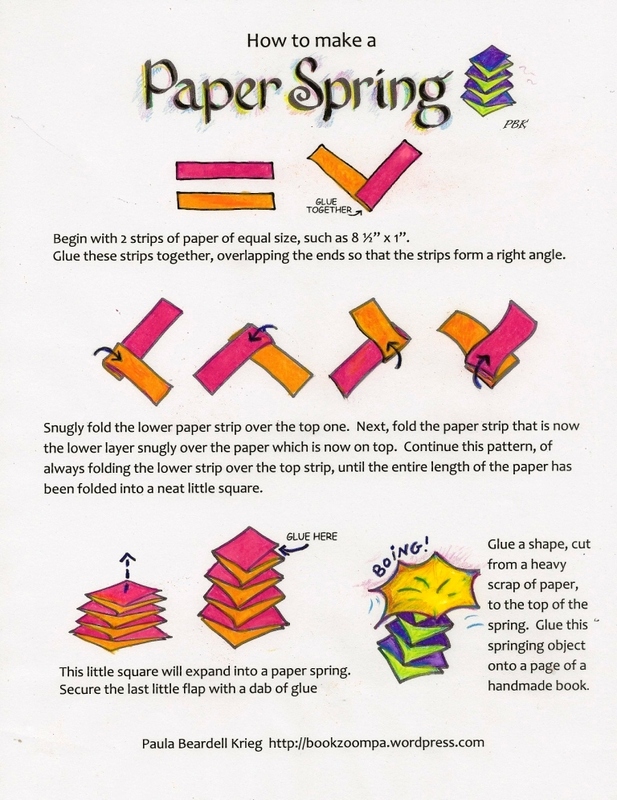 This illustration can be drawn directly onto the paper of the book, but, since the papers I used were brightly colored, we drew on a separate piece of 9″ x 7″ white paper, which was then glued into the book. 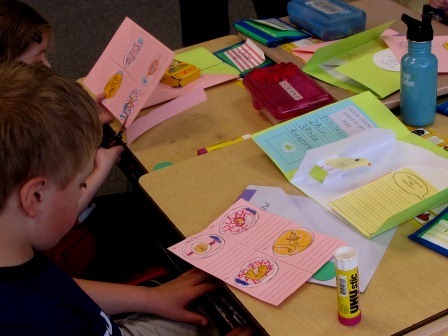 The classroom teachers worked with students on their writing pieces before I arrived. 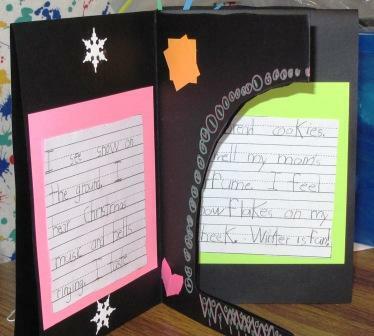 These writing pieces were framed on brightly colored papers which were then glued into the books. On the last page there was room for “Author Notes,” and a cut-out tracing of the child’s hand, which was attached on to the book with a paper spring. The hand, therefore, waves. 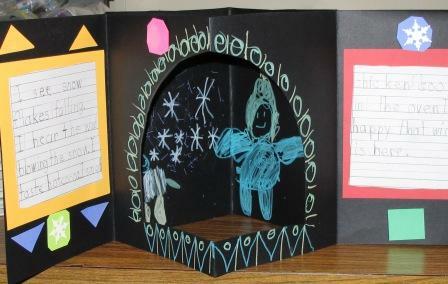 Some of the books were made out of black paper. For these, I supplied the students with Gel Markers, made by Crayola. Although the color choice is limited, these markers show up well on the black paper; this makes working with them quite exciting.